For Commercial farmers we ship either by bulk or in mulox bags, using tarped (belt bottom) trailers and to farther destinations in refrigerated trailers (reefers) ensuring the potatoes are kept at a constant temperature until arrival. 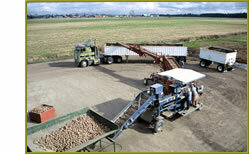 Grading is done directly from the storage facility to the delivery trucks minimizing handling & bruising. This provides our customer with seed that will produce the optimum quality and yield. Pricing & shipping costs are dependent upon the variety chosen, amount ordered and distance shipped.